In an earlier post, I covered how onboarding is more than just a one-time event in a customer’s journey. In this post, I’ll be making the case for applying more than one onboarding method. Just as students will fail to learn if taught with a one-size-fits-all approach, trying to onboard every user in the same way is bound to fail. Until midway through junior high, I was an all-A’s student. I didn’t worry about my grades. Then, I started taking algebra and within a few weeks found myself desperately trying to hold on, failing most of my assignments and averaging a D- in the class. What had happened to me? I was failing because I hadn’t grasped the concept of variables as quickly as my classmates had. Many of my peers had older siblings that had taken algebra before, or had done pre-algebra tutoring sessions, or didn’t come in with any preconceived notions at all, so, when our teacher gave a 15 minute explanation of variables on the first day, these classmates immediately understood that X (or Y, or Z) represented a placeholder value that changed based on an equation’s context. The instructor assumed that this concept didn’t need more than his cursory explanation and continued forward. Meanwhile, my preconceived notions about variables meant I started algebra in a less pragmatic position. I’d always watched far too much TV, and I’d been seeing variables in the context of overblown equations from cartoons and movies, where the hero (or villain) would be solving complicated problems bedecked in letters. Because of this, I’d built up a rigid [if not ridiculous] mental model that letters like X, Y, and Z represented special, fixed values that only experts were privy to, to be revealed only to students who had reached a certain level. So I sat in class, waiting for the teacher to provide the official legend that would show what values were assigned to each letter, frustrated that my classmates seem to have gotten access to that key without me. I fell behind. My pre-existing mental model had made it harder for the teacher to teach to my expectations, and he hadn’t considered that one of his students might need a different amount of guidance than the others. Luckily, a classmate took pity and offered to tutor me. Once my she discovered the source of my issues, and clarified what variables represented, everything clicked, and I survived with a decent grade. This is the challenge of teaching: while we want students to come away with the same baseline knowledge, the same class flow won’t work for everyone. In algebra, I’d needed more help than my peers, but my peers would have been frustrated if they’d had to slow down their learning to match my speed. 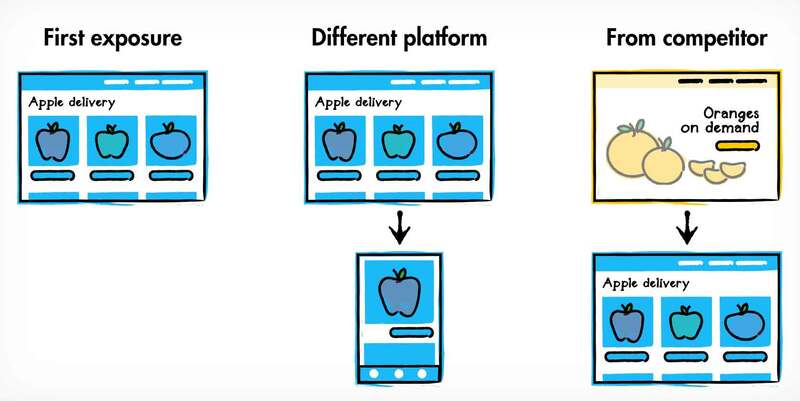 In our products, onboarding ideally brings users to the same destination, but not every user will (or should) arrive at it in the same way or at the same time. You may create a new user onboarding flow that goes from point A to B, but person 1 might need more help, person 2 may just breeze right through, and person 3 might take a …roundabout approach. These paths often vary because of different histories a user has with your product or its type, which in turn influences their expectations and how much, or little, guidance is needed to work with those expectations. A user who has never used a product of your type before many come in as an empty slate, and need a lot of guidance. Someone migrating from your product on one platform to another, such as from your site to your app, will be less in need of guidance. A person coming from a competitor will have expectations about what should be different, and what should be the same, and may need intermediate levels of guidance. Looking at a user’s entry point can hint at the expectations they’re starting with. Entry points might include a referral from a friend, links from partner sites or search engines, or a special promotion. For this reason, it’s important to handle deep linking–allowing users to drop into a specific landing page or sub-flow of a product–to allow people to get an experience aligned with their expectations. It can be frustrating to follow a link to view a particular feature, but then be led to an app’s start screen, a sign-in prompt, or a website’s generic home page. 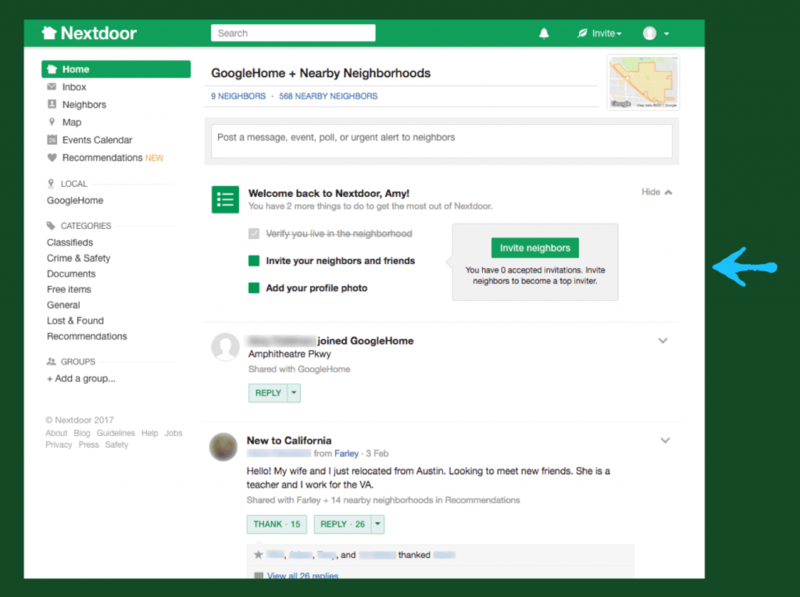 In this example from Nextdoor, a neighborhood networking site/app, I’ve referred a friend to join. She’ll enter the experience already having some context as to the conversations that are already happening in the area, thanks to knowing me. Her expectations will be different than someone joining as the first in their neighborhood. Another factor influencing the onboarding paths is how people learn. Now, people will often demonstrate different preferences for how they like to learn new things. But, some product teams, especially those less familiar with the teaching world, inevitably mistake learning preferences with learning styles. They incorrectly set out on a path to find one teaching approach to assign to each user. 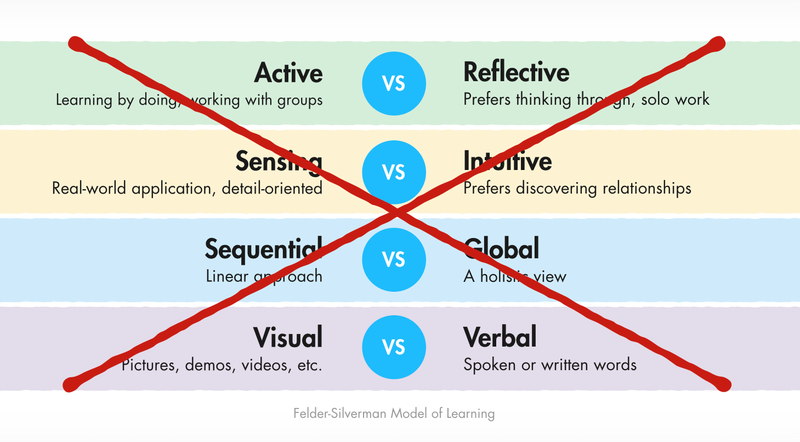 One model for learning styles, the Felder-Silverman model, suggests that some people might be active learners and best learn by doing, while others prefer thinking things through reflectively. Or that some are sequential learners, learning linearly, while others prefer a holistic view. But the reality is that people can leverage any of these methods, and they can all be successful in different situations. A one-size-fits-all approach to onboarding is problematic because users won’t be able to benefit from multiple learning techniques. And users who have physical or learning impairments would be prevented from benefitting from an approach designed for one type of user. Instead, products should offer more than one option for onboarding guidance. This doesn’t mean teams have to spend months figuring out what learning methodology to apply to each individual user. It just means they need to assemble a toolkit of sorts, so that guidance around any one topic can be represented in more than one way. Let’s take a look at 6 categories of guidance that comprise a good onboarding toolkit. A requirement for every onboarding toolkit is a selection of thoughtfully-designed default states. Consider what a website’s home page or an app’s start screen communicates to a new user. Think about what settings could be automatically applied to a brand new device, or how a newly introduced feature behaves initially. For content driven experiences, a good default state is all about a clear information architecture. Allow the organization of content to implicitly communicate the purpose of a product. 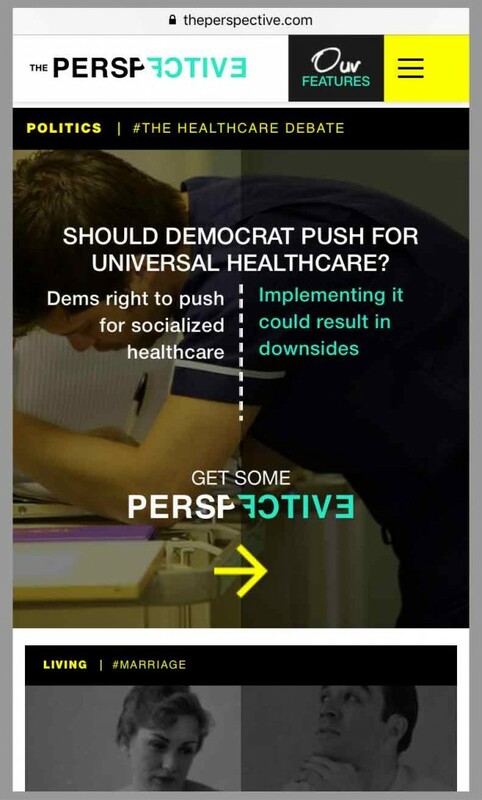 For example, a news website called The Perspective claims to present at least two sides to every news story. The default layout of the articles on their website communicates this without an explicit onboarding flow. The layout of “The Perspective” implicitly educates users about the experience it provides. If a product is task-oriented, the default state can set expectations about actions required. 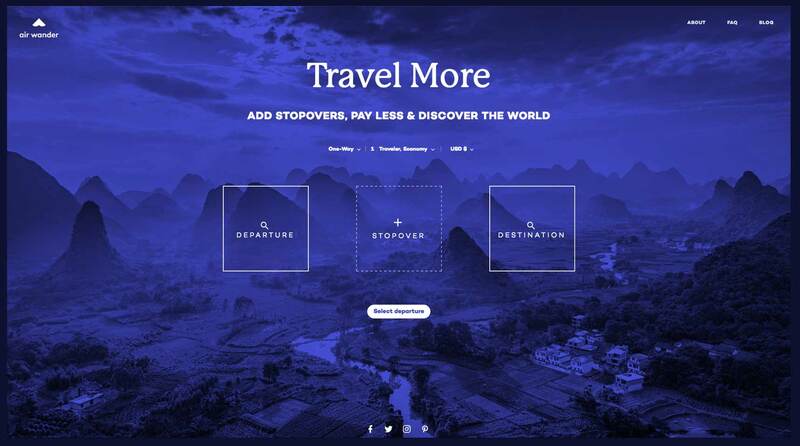 AirWander is a website that helps people find interesting stopovers between two travel points. It begins with a default state that shows a skeleton of the information users will input to get flight search results. This skeleton guides the user to select a departure point and a destination, then highlights the middle “Stopover” box to get them to select one, so that they can move onward to search results. Applying default settings can also be powerful. Etsy recently introduced a new feature called Pattern to existing shop owners. This feature allowed them to create a custom website using the listings that they already had on Etsy. 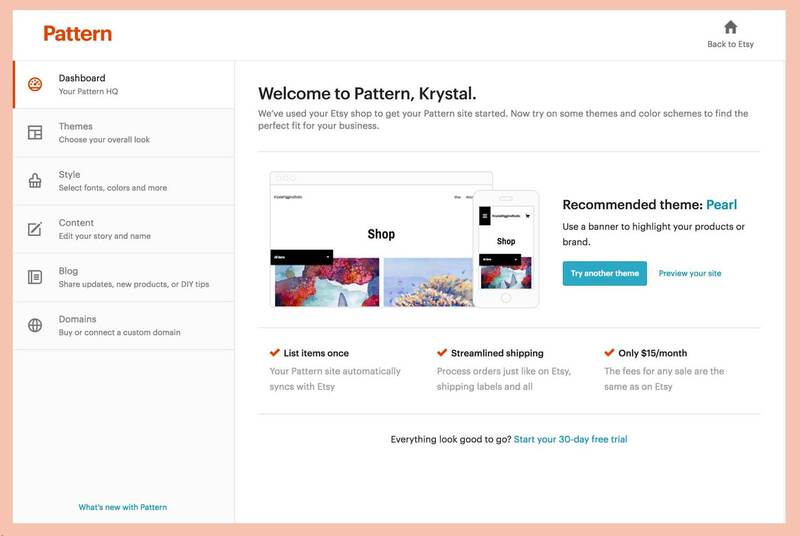 When the shop owners tried out the feature for the first time, Etsy automatically applied a default design template for their site, allowing them to quickly publish a free trial and see if custom websites are worth the investment, before spending time tweaking a theme. A study done by Jared Spool on users of desktop computer users found that less than 5% of people changed their default settings. And even employers that apply default fund selections in 401k plans and auto-enroll employees see increased 401k plan participation. Defaults, again, can be powerful when done well. A good set of default states underpins every good onboarding toolkit. Once these are in place, other techniques can provide additional avenues for guidance. One technique that many choose to include in an onboarding toolkit is inline guidance. Inline content can be effective at onboarding someone within the flow of surrounding content, without the effort of building separate, standalone flows. 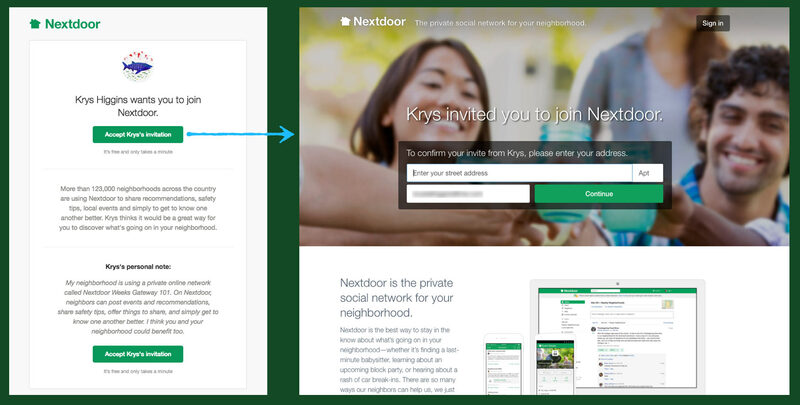 Nextdoor inserts an inline checklist of next steps at the top of a user’s feed after their initial signup experience, encouraging the user to improve their profile in the flow of the rest of their content. 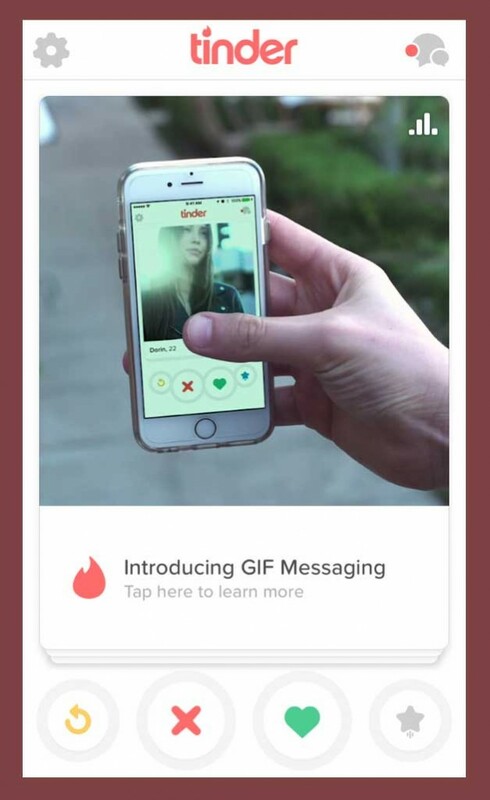 Tindr includes an occasional “tips” card inline with the rest of the matches cards. For more examples of inline guidance, as well as the pros and cons of using it, take a read through this earlier post. Where inline guidance is fairly passive, reactive onboarding techniques provide guidance in response to a user’s action. It helps people learn through direct manipulation and supports a “learning by doing” approach. Reactive guidance is best for low-risk situations where there aren’t serious, negative consequences to a trial-and-error methodology. 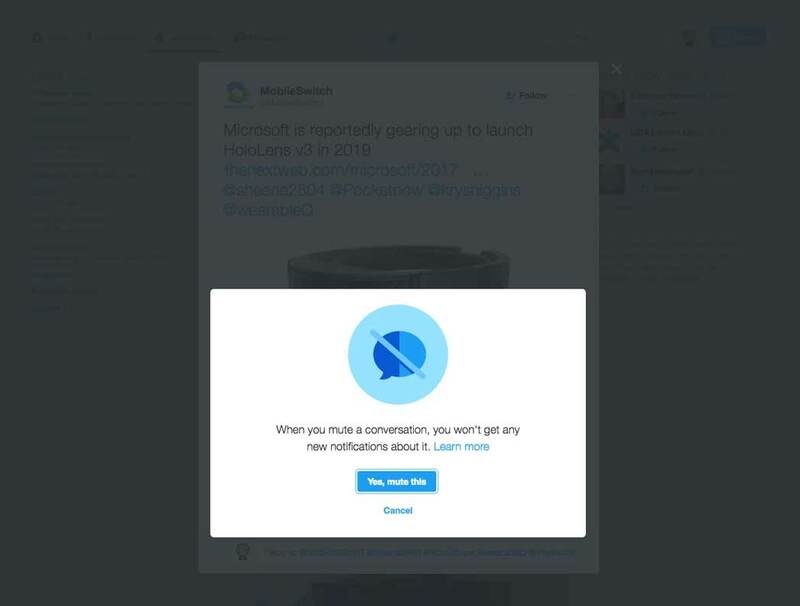 When Twitter introduced their mute feature, it didn’t force all users to go through a mini-onboarding process the next time they opened the app. Instead, Twitter waited until they performed the mute action for the first time and then displayed a one-time informational about what muting does and where its settings live. On subsequent uses of the mute action, this informational screen no longer appears. By displaying information in this way, it ensured the user was in a state of readiness to understand more. 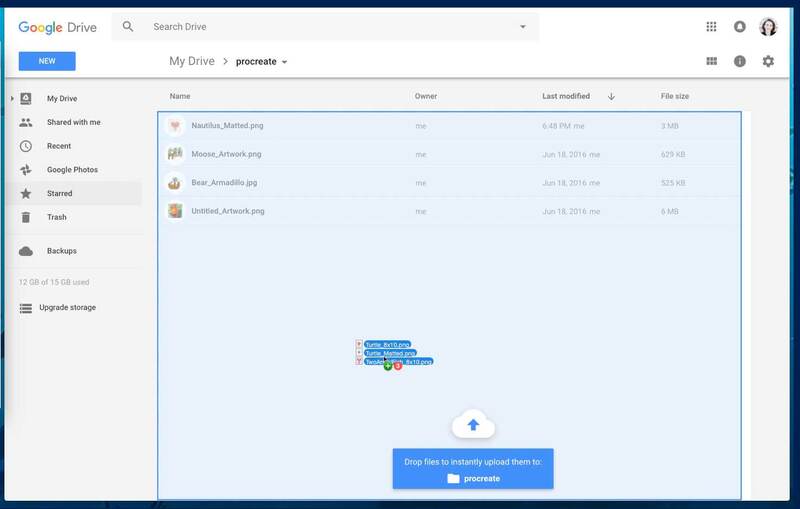 In another example from Google Drive’s web client, a reactive hint appears when dragging files from a desktop folder over the web client interface. It’s there to indicate that these items will be uploaded if they are released while over the web page. It’s subtle enough not to interrupt users who already understand this behavior, but noticeable enough for users who weren’t aware. The complement to reactive guidance is proactive guidance. This approach is marked by prominent, directed onboarding elements that try to anticipate a user’s needs before they get stuck. Whereas reactive guidance is appropriate for a wide variety of situations, proactive guidance should be used sparingly, since it makes a lot of assumptions about what any one person wishes to experience at a particular time. “Prominent” doesn’t mean we have to shove modal overlays in a person’s face. It can be achieved by steering someone to an ideal flow on first visit, like Duolingo does when it encourages new users to take part in a placement test or their first lesson. The user can skip out of either of these options, but the first experience in the product directs them prominently towards one or the other. 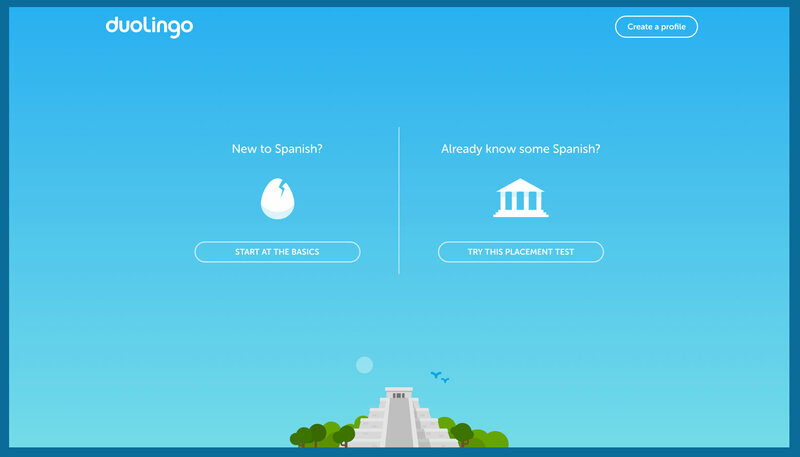 Duolingo, a language learning site/app, leverages a proactive approach. After new users choose the language they want to train in, the app encourages them to jump into their first lesson or a placement test. No matter which path users choose, they can skip it and explore the site’s dashboard. Duolingo is proactively trying to coax users into the flow that may lead to the highest engagement and success. Proactive guidance can also be a bit more supplemental, like providing hints that point to new features or changes. 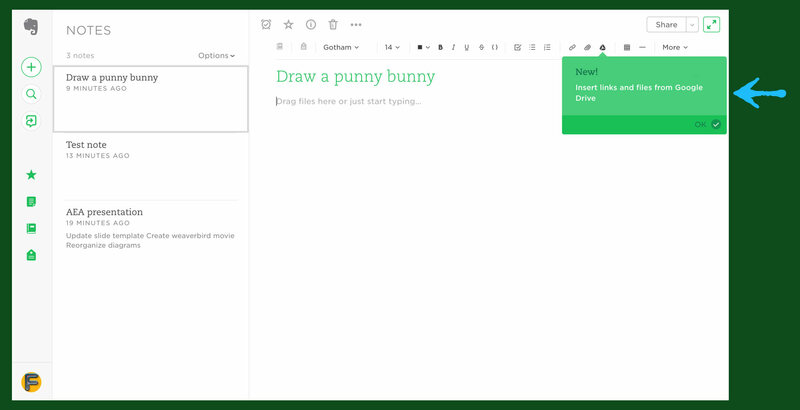 Evernote’s web app uses this to point out new features without disrupting an existing user in the flow of creating notes. We can use proactive guidance that doesn’t interrupt the user’s experience with a full screen takeover or long-winded slideshow. No matter how many onboarding techniques are available, it will be impossible to anticipate every individual’s needs. It is necessary to include avenues for self-help. For example, if my algebra teacher had offered office hours for 1:1 instruction, I might have been able to resolve my struggles a lot earlier. Therefore, a well-rounded onboarding toolkit should include resources for on-demand guidance. On-demand guidance includes help articles, customer support chat, community discussion, or a video library. These resources should be centralized and the entry point(s) easily discoverable. In some cases, it may also be appropriate to explicitly point out where users can go to learn more or get personalized assistance at the end of a dedicated onboarding flow. 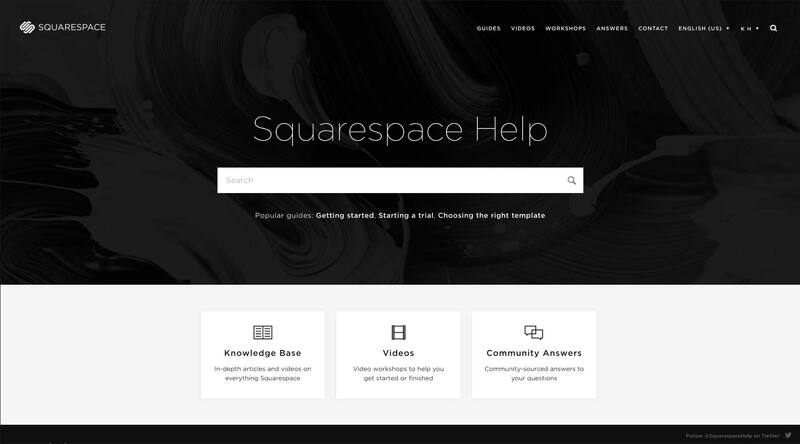 Squarespace’s help page is a centralized resource for their help articles, videos, and community forums. Even the link to their Twitter account at the bottom of the page offers another avenue to get help. Making guidance on-demand also helps users that skip or ignore onboarding steps because they “don’t know what they don’t know” and are eager to get started. Later, these users may realize that they’re missing something. 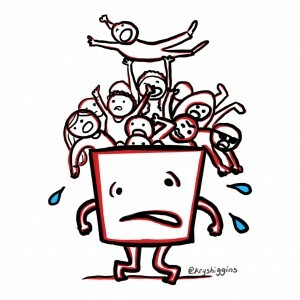 Having on-demand assistance, or a way to revisit onboarding steps, can help them recover. This technique is a rather new addition, and the name came out of a podcast discussion with Chris Coyier, but it is rooted in a core social learning concept that people learn by observing and imitating others. Voyeuristic onboarding is the idea that users could be guided into a new product by watching other people use it, and seeing their authentic results. Products built for shared presence experiences often leverage voyeuristic onboarding, even if unintentionally. Some VR headsets output a 2D representation of what the main player is experiencing on a nearby TV. This allows non-players in the same room to observe how the the player uses device in physical space, how they interact with the software in virtual space, and the results of those interactions. Similarly, people visiting friends with a voice assistant device in their homes may learn what kind of things they can ask their own device. Even the streaming service Twitch offers what might could be considered voyeuristic onboarding, as some users stream their first time through a game, or the unboxing of a device. The reason I label this a “bonus” technique is because authentic voyeuristic onboarding situations aren’t easy to architect. Creating a bunch of marketing videos of people using a product may not do the trick because it’s inauthentic; voyeuristic onboarding is more about seeing real people have real experiences with a real product. This is why a library of how-to videos or sponsored live streams might not see much success. To leverage this technique, it’s more about facilitating its occurrence. One way could be to implement a “public demo” mode that’s easy for existing users to activate so that they can show something off to others. A product brought to events could create a voyeuristic situation, like how many video games are introduced at gaming conventions (although it risks that the gap between a user’s exposure at an event and their acquisition of the product later causes forgetfulness). If facilitated well, voyeuristic onboarding could be a key part of a product’s onboarding experience. But until the concept matures, it remains a nonessential part of an onboarding toolkit. A product doesn’t have to make use of all of these. It just needs to have more than one to help different users in different situations reach the same destination. 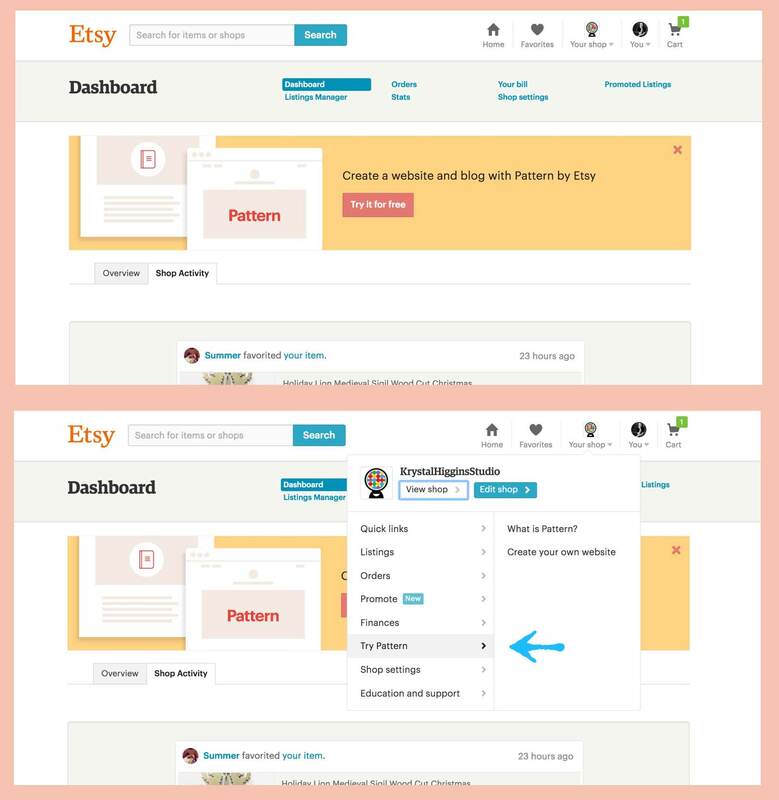 Etsy has an inline treatment to introduce sellers to their Pattern feature, but, if the user ignores or dismisses it, the entry point also is part of their default menu system. There is more than one way to reach this destination. This makes our onboarding experience accessible to a wider range of users, and the more users that can be effectively onboarded, the more retention and engagement will grow. When you have more than one approach to onboarding, you can carry different types of users through your onboarding experience. Thanks for the great presentation on onboarding in CBA. Unfortunately the Q&A time was limited. I hope you will find a minute to answer my question about onboarding. What do you think about onboardings that are forced on user without an opinion to skip them? I don’t mean a flow like registration, but more like an onboarding about a new feature in the product. Does designer have a right to decide for user whether they have to walk through onboarding flow now? Hi Davyd, good question. Onboarding is a long-term process that includes many parts. If the onboarding experience is only comprised of flows that feel separate from everyday use of the product, or if onboarding is only used to talk about a product, then it’s already set up to fail. The process of onboarding should feel like a natural extension of the product it’s in and not like something that someone feels like they need to skip. Now, sometimes onboarding contains one or two separate flows for good reason (for example, a setup flow to pair a secondary device to an app). If that flow is required for the product to work at all, then it might not be possible or good for the user to skip it. However, very few current products fall into this category. A lot of onboarding walkthroughs are just trying to tell a user where things are at, yet people don’t pay attention to those passive instructions. For these, you should always offer users an “out.” This can be a way to skip and return later, or to use a product without an account and skip account setup. In summary: People only want to skip something if they feel like it’s preventing them from normal use. If an onboarding experience feels like a separate task, and if everyone wants to skip it, it would be worth redesigning it to facilitate–instead of interrupt–expected use.